Who Doesn’t Want Multiple Commanders? This spoiler season I, like many of you, spent a lot of time ignoring my family, friends, and obligations by staring down the firehose of newly released spoilers from Ravnica Allegiance. While a lot of the new cards have caught my eye for various projects (Benthic Biomancer is immediately getting shoved into our Lazav deck from last article, for instance), the card that excited me the most was Theater of Horrors. While a lot of people compared it to Phyrexian Arena in a less than stellar light, I saw Theater of Horrors as something else entirely. You see, if you happen to have a Xantcha, Sleeper Agent Mass Discard deck, Theater of Horrors is a backup Commander. When I first saw Xantcha’s newest form, it immediately struck me that she would be excellent if you could just properly incentivize your opponents to want to keep her. Most folks will try to get her off the board, to avoid taking any damage, but what if there was a way to ensure people would want her to stay on the board? From there, I figured the easiest way to achieve this was to make sure no one ever had any cards, and a new deck was born. This deck is focused just above the Precon level, and is not meant to be optimized with full interaction, much less the Contamination and Blood Moon effects you might find in a fully optimized version. It was meant to focus entirely on the discard and mana theme, at the cost of not eating any of its vegetables at all. By the way, let me quickly mention that Mana Cache is one of the most fun cards in Magic and not enough people are playing it. This deck could certainly stand some tuning, but given that I’ve been tweaking it to be at a “just above the precons” power level, it’s doing pretty well. I wanted to avoid making another Xantcha Animate Dead/Worldgorger Dragon combo deck, which uses infinite mana to activate Xantacha’s ability over and over again, terminating your opponents. As a side note, this combo also works with Piranha Marsh, and the ‘second commander’ we’ll be discussing today, Theater of Horrors, so now it’s even easier to go infinite that way for the folks who pursue that route. Suffice it to say, the deck can and does draw some hate, but if you can empty out everyone’s hands, you have more than enough tools to convince people to burn out the biggest problem at the table instead of focusing on you. You’re right, doubting-yet-astute reader! It doesn’t look like another copy of Xantcha, Sleeper Agent at all! Theater of Horrors does deal damage to a player (or planeswalker), but only we can pay mana into it, and it’s substantially more expensive for less damage. Plus, it only ‘draws’ one card a turn. Instead, as an enchantment, it never engages in combat, which never puts it at risk. As an enchantment, it’s one of the hardest permanent types to remove. Plus, remember that the deck above is built around discarding everyone’s hand and encouraging others to use Xantcha to mow down the current Archenemy. Theater of Horrors “draws” a card every upkeep, but unlike Phyrexian Arena, the card goes into exile, not into our hands, playable only when an opponent loses life. This makes it playable, certainly, but from our opponents’ perspective, Theater does a bad impression of Xantcha’s abilities. Which is perfect, because that means our second commander flies right under the radar. Remember that little ‘exile’ detail? Given that the strategy we’re pursuing to keep Xantcha valuable to the table is to have everyone discard their hands, we’re going to be playing a lot of “each player discards” effects, especially since they’re substantially cheaper than effects that cause just your opponents to discard cards. Thus, it is very likely that we ourselves will often end up discarding our whole hand to something like Sire of Insanity. Having an exiled “hand” that is immune to those discard effects is perfectly potent. In other words, Theater of Horrors card draw is probably less efficient when it comes to quantity, but may be better than our Commander when it comes to quality. It is also definitely worth noting that the Theater’s activated ability, while nowhere near as good as Xantcha’s, is not wholly necessary to give us access to all those exiled cards. We have a lot of other effects in the deck that will deal damage to opponents. Though if we ever do get ludicrous amounts of mana, it’s nice to know we have a fallback option! But… I Already Have a Commander? I can hear some of you saying “Wait a minute… I can already play my Commander multiple times per game, why would I want to plan less powerful redundancy?” I can understand this perspective, as I had the same view a couple years back. I had just opened a Samut, Voice of Dissent at the Amonkhet Prerelease, and had immediately set about making it into a Pingers deck. Since I built it from the trade binder route, rather than by making a whole list and then ordering singles, it was pretty rough. As such, I was talking to friends about what they would do to improve my fun pet deck, when one of them brought up that they were surprised I wasn’t playing the ‘original version’ of my Commander. Having never even heard of Thousand-Year Elixir at the time, I hadn’t considered the option. After looking it up, I still scoffed at the idea a bit. Why would I need another copy of my commander’s ability, especially one that didn’t grant my Godsire (and its tokens) true haste, so they could attack right away? After talking it over a bit, though, my friend convinced me that, at worst, it was another untapper, and it would still allow me to untap my Fyndhorn Elders and Prodigal Pyromancers an extra time, whether I had my commander in play or not. I’m very glad that I listened. Not only does it provide an extra untap, but now, Thousand-Year Elixir is almost always a better version of my commander in the deck. It comes down faster, it’s harder to remove, and I don’t need white mana specifically to use my Kamahl, Pit Fighter several times a turn. While I don’t draw it every game, in the games that I do, I am never unhappy to see it. Indeed, often I am praying to draw it when my commander is immediately removed for the third time in a row. That last issue is not unique to any specific deck. We all play removal for commanders in our decks, so having a backup to keep the wheels greased and the deck on track can only be good for you, and should be something to consider in every deck that has the option. If those options take the form of another creature that does something similar, that’s still beneficial, and will give you a new lease on life without having to pay extra commander tax. If those options come in the form of an artifact or enchantment, then that can be even better. Since we’re playing a Rakdos deck, we are all too familiar with how difficult it can be to remove enchantments specifically, and it’s not much easier when it comes to artifacts, so it’s great to find redundancy in very different forms, so make your strategy harder to disrupt! With that in mind, we should make it our mission in deckbuilding to plan around the fact that people build their decks knowing that they’ll have to take out problem commanders on sight. 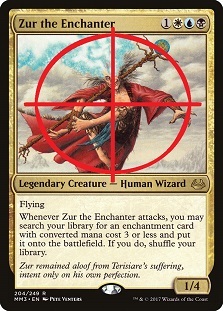 The EDHRECast recently did an episode where they briefly discussed “Kill on Sight” commanders, because it seems like there are more and more of those with every new set. Even if your commander is able to fly under the radar a bit, it’s still a great idea to plan for it to get removed and therefore get more expensive. Trust me, there is nothing more disheartening than playing Xantcha, Sleeper Agent for nine mana, watching the entire table draw cards with her, then witnessing her death right before you untap. So… What Do We Cut? Now that we’ve decided that diverse and redundant effects are super useful, even if they appear worse than our commander, we know we’re going to play Theater of Horrors. The question remains: what are we going to cut? To answer that, let’s look at similar cards in the deck, which has been and will continue to be our go-to first step in this series. After all, why would you look at cutting something else when you can do the same thing a completed deck already wants to do, but better? All in all, we have six other sources of card advantage in the deck that allow us to play spells and/or lands from our library instead of our hand. That’s enough that we can be fairly confident that we’ll see one per game. We also have two other sources of more conventional card advantage (Asylum Visitor and Geth’s Grimoire), so in total we’re actually sitting at nine effects that can help us stay in for the long haul, one of which is in the command zone and can therefore be utilized multiple times. With that in mind, I think it’s more than prudent to cut one of the existing effects for our new toy, so let’s do some comparisons. Let’s start with the easy stuff that leaps out as better than or equal to Theater of Horrors. While Experimental Frenzy does have the drawback of not allowing you to play the cards in your hand, it also is by far the most powerful version of this effect available. Given that you can basically “draw” cards until you hit two lands or run out of mana, it’s often even better than the more expensive options (Etali, Primal Storm and Sunbird’s Invocation). On the other hand, Chandra, Torch of Defiance is a fairly weak version of this effect, but checks so many different boxes this deck needs that we’re never taking her out. So from the list above, that leaves a four mana artifact, a four mana enchantment, and two creatures with conditional triggers for their exile “draw.” I’m going to remove Oracle’s Vault from consideration in this instance, for reasons outside of card quality; half the reason I ended up building this deck was just so I had a use for at least one of my Amonkhet prerelease-stamped foil Vaults, of which I opened four in a row that prerelease weekend. Outpost Siege is pretty much directly inferior to Theater of Horrors in our deck. That said, the reason that Outpost Siege‘s Dragon ability isn’t better in our deck is because we’re only playing about twenty creatures total, so having more creatures does come at a bit of a premium. Looking at our two creature options, Stromkirk Occultist fits the bill as a nice, efficient creature with upside that even synergizes with the deck, given the ability to cast it for its Madness cost when it’s discarded. Etali, Primal Storm, on the other hand, is a massive amount of power that will often die before it does anything, as we lack the means to give it haste. Then again, consistently eating a removal spell is hardly a reason to hold something against a card. So with all that considered, what would you choose to cut? Outpost Siege leaps out to me specifically, because Theater of Horrors is both cheaper and has a much larger upside despite it’s damage drawback, but half of the difficulty in making decisions like this is that everyone has a different idea of what’s good, what’s important, and what is neither. Do you agree? Disagree? Let me know what you would have cut (or if you even would have) and what you think of the deck! What would you do to power it up? What do you like to do to keep decks at a lower power level? How do you feel about not playing as much interaction as you know you should to keep a deck more “on theme”? Let us know so we can get to our best 99 together! Coming Up Next Time: You didn’t think we were just gonna not talk about Captive Audience and The Haunt of Hightower, did you?